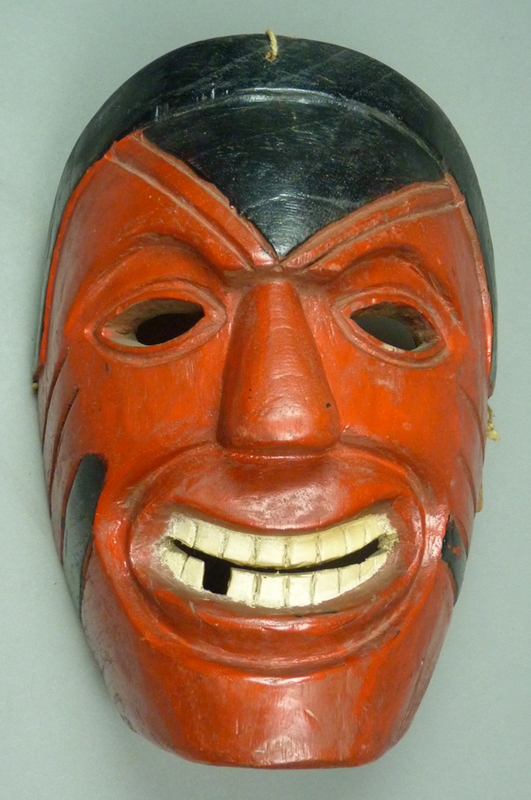 This week we will examine Xantolo masks from Hidalgo and Veracruz that are painted red. The first has a refined design. Were it painted another color, I might think that it was a mask from the Juanegros dance. I bought this mask from Jaled Muyaes and Estela Ogazón in 1999. 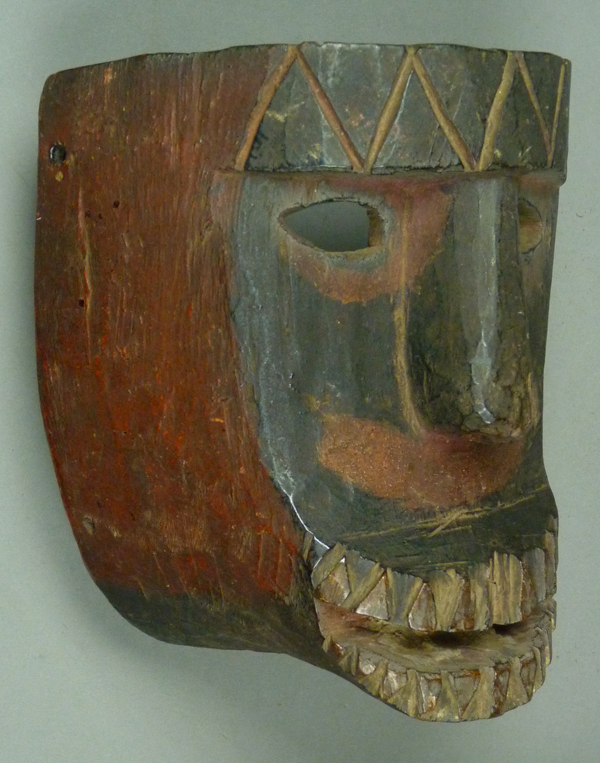 This is an attractive mask that is simply carved. Neither the hairline, the mustache, or the goatee are carved in relief; they are simply painted. 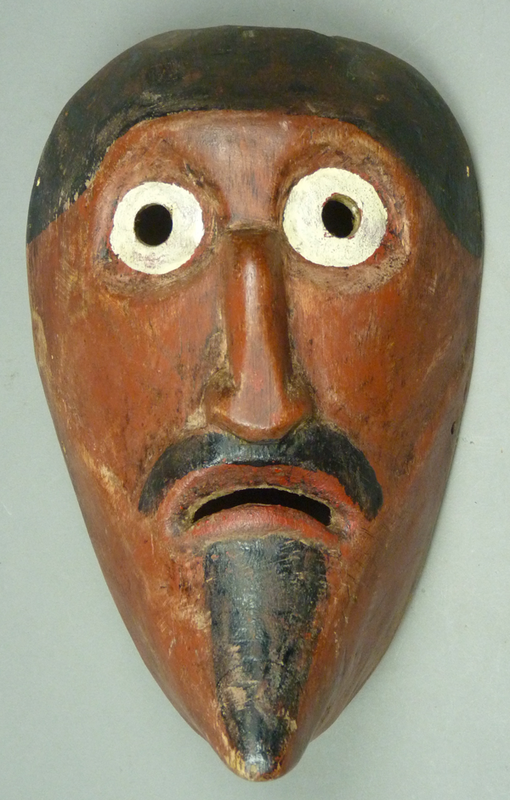 The Xantolo masks that follow demonstrate the role of color to mark the face of a dead man. The first three of these are painted yellow. Such an unnatural color may well be intended to convey that this person’s skin is no longer healthy or alive. I got the first of these from Jaled Muyaes and Estela Ogazón in 1997. The “buck teeth” give this mask a silly expression. 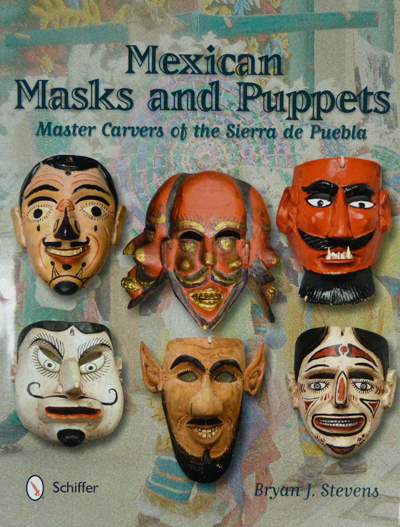 In the last four weeks we examined two general categories of Xantolo masks that were described by Jaled Muyaes and Estela Ogazón in their 1981 book, Máscaras—those that are finely carved and with realistic features versus others that seem primitive and/or geometric. Although I have relabeled the geometric masks as the Xipe Totec style, there are others that do seem more appropriately described as “primitive,” idiosyncratic, or borrowed from another dance; these will be the subject of discussion in this next series of posts. Here is one that is especially strange and idiosyncratic, so striking and alien! I see it as a masterpiece of folk art that can stand against almost anything from any culture. I bought this mask from Jaled Muyaes and Estela Ogazón in 1997. It was found in Hidalgo. Evidently it is intended to be grotesque. 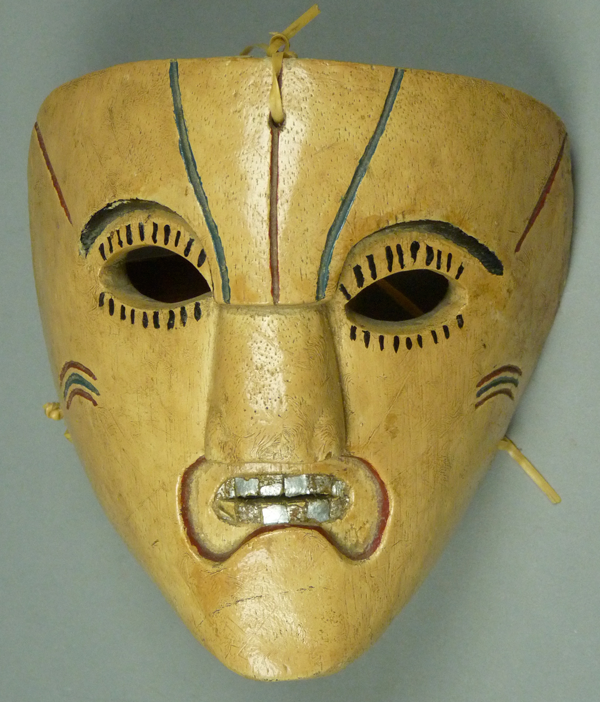 In this post I will conclude my review of Xantolo masks in the geometric or Xipe style. The masks in today’s sample fit this standard more loosely, yet they have elements of this type. Most have the layered mouth within a mouth design, while one simply has a mouth of that shape, but without the extra layer. The first three and the last have the characteristic inscribed geometric lines; two others lack that feature. Looking at these masks, side by side, one realizes how wide and varied is the area in Hidalgo and Veracruz where the Xantolos continue to dance. The first of this group, which I purchased from the Cavin Morris Gallery in 1994, was found in Taxtitla, Municipio of Chalma, Veracruz. The depiction of a mouth within a mouth is dramatic. All of the teeth are covered with cigarette package foil. 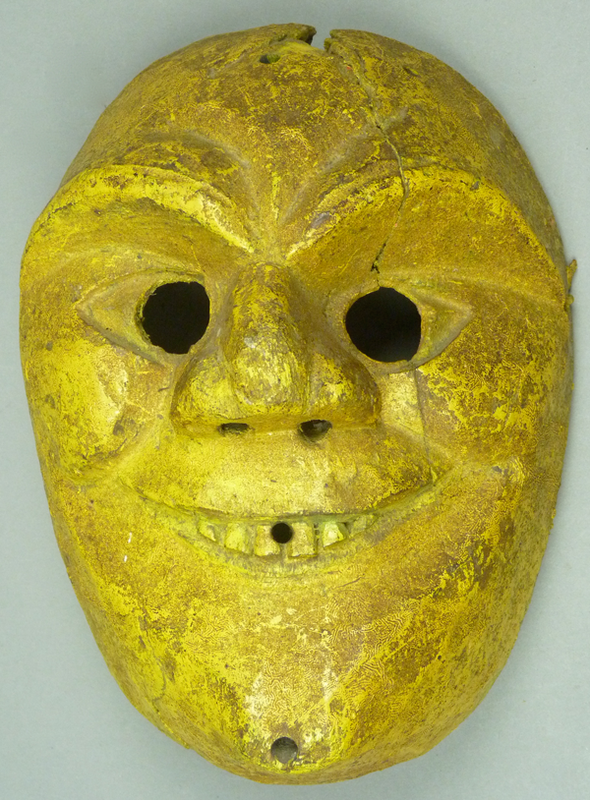 Today I will continue to show Xipe Totec style (or “geometric”) Xantolo masks. I got this large mask from Jaled Muyaes and Estela Ogazón in 1998. It is from San Icantitla, in the Municipio of Huazalingo, Hidalgo. I can not find San Icantitla on a map; it must be a very small place. We see again the mouth within a mouth design that I am labeling as a depiction of an ancient Aztec god, Xipe Totec.